Under the GMA, the city is required to consider Best Available Science in its CAO regulations. The BAS does not support elimination of buffers for small wetlands. Wetlands provide many ecosystem services including water filtering, ground water recharge, flood reduction, nutrient creation, carbon sinks, biodiversity and habitat connectivity, storm water control, and more. Recently, science has been analyzing the practice of filling small wetlands, and mitigating for their loss through expansion of existing or new centralized wetland sites. The evidence is clear that this results in a loss of ecosystem functions and benefits. 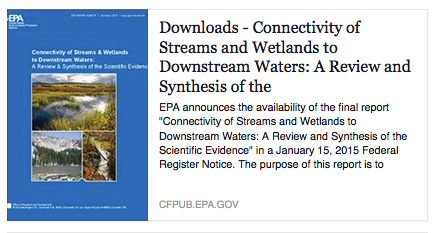 Earlier this year, the U.S. Environmental Protection Agency’s (USEPA) Office of Research and Development finalized the report Connectivity of Streams and Wetlands to Downstream Waters: A Review and Synthesis of the Scientific Evidence. The report reviews more than 1,200 peer-reviewed publications and summarizes current scientific understanding about the connectivity and mechanisms by which streams and wetlands, singly or in aggregate, affect the physical, chemical, and biological integrity of downstream waters. The conclusions of the report were clear… all wetlands and streams, regardless of their size or frequency of flow, are connected to downstream waters and strongly influence their function. Small wetlands, even those lacking surface water connections, provide physical, chemical, and biological functions that could affect the integrity of downstream waters. In fact, some potential benefits of these wetlands are due to their isolation rather than their connectivity. The literature strongly supports the conclusion that the incremental contributions of individual streams and wetlands are cumulative across entire watersheds, and their effects on downstream waters should be evaluated within the context of the watershed ecosystem. There is no rationale for disregarding the functional value of the smallest of wetlands, particularly on a cumulative basis. In other words, there is no valid basis for eliminating buffers for small wetlands. This entry was posted in Commentary, Facebook Post, Information and tagged Best Available Science, biodiversity, Buffers, Critical Areas Ordinance, Ecosystem, GMA, USEPA, Wetlands, Whatcom County. Bookmark the permalink.